Latin name: Medicago sativa L.
Alfalfa is a perennial flowering plant that resembles clover, with clusters of small purple flowers followed by fruits spiralled in 2 to 3 turns containing 10-20 seeds. It represents an important forage crop in many countries around the world. North America covers over 40% of the production, but there are also considerable production area in Argentina, Canada, Russia, Italy, and China. A good thing of these crops is that they can be harvested three to six times in one summer, providing a prime nectar flow every time the plant regrows and blooms. Yet the plants are considered to make the best hay only if they are cut before flowering. This is bad for honeybees and beekeepers. Seems that a choice is needed here: honey or better hay. It has an unique pollination mechanism. A problematic one. The pollen-carrying keel of the alfalfa flower trips and strikes pollinating bees on the head, which transfer the pollen to the foraging bee. But, our usual western honey bees do not like to be struck in the head repeatedly. (well, pretty understandable.) So, the older (more experienced) bees have learned to defeat this action by drawing nectar from the side of the flower. Thus the bees collect the nectar, but do not carry the pollen and they won’t pollinate the next flower they visit. Yet, the pollination of the lucerne crop is done and this is die to the younger bees, with less experience, which have not yet learned the trick of avoiding the pollen. They will collect the alfalfa pollen, which has a khaki color and make it an average pollen source for the honey bees’ food supply. If the western honey bees are harvesting only alfalfa they may suffer protein stress, due to shortage of one of the amino acids comprising the pollen protein, isoleucine. Besides honeybees, there are other solitary bees, which are better at pollinating alfalfa. 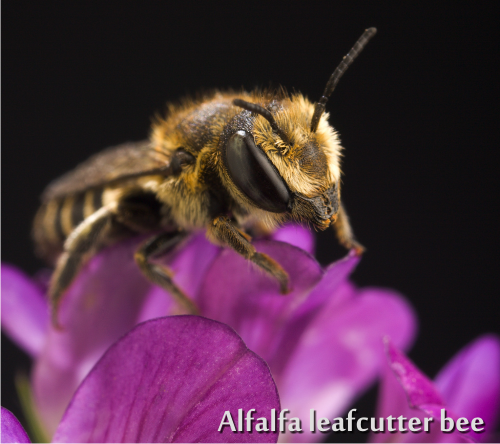 The leafcutter bee is a solitary and a gregarious bee species that makes a very efficient pollinator of alfalfa crops. It doesn’t live in colonies and it doesn’t store honey. It nests in individual tunnels in wooden or plastic material, supplied by the alfalfa seed growers. The leafcutter bees are used in the Pacific Northwest, while western honeybees dominate in California alfalfa seed production. The leafcutter bees (Megachile rotundata) are only half the size of a European Apis mellifera honeybee and their stripes are black and white. They are used extensively in Russia, Canada, USA and New Zealand. Canada exports US$1 million worth of leafcutter bees every year! Yes, simply due to their ability of pollinating alfalfa. To polinate 1 ha of alfalfa crop there is the need of 8 colonies or 70,000 leafcutter bees. Alkali bees (Nomia melanderi) are black with yellow bands on the abdomen and a light yellow layer of hair over the whole body. They are of the same size as the European Apis mellifera honeybee, but more slender. Alkali bees are present in many of the north western states of the USA. One acre with one million alkali bee nests can pollinate 200 acres of alfalfa. Bombus affinis also known as “rusty patched bumblebee”, a species of bumblebee that is endemic to North America. It is the primary pollinator of key dietary crops, such as cranberry’s, plums, apples, onions, and alfalfa. They are social bees like honeybees and are used for pollination only. No honey can be harvested from them. Small bumblebee colonies are most often used in greenhouses. As with the solitary bees there are no problems with stinging, and people working in the greenhouses prefer bumblebees to fly around instead of honeybees. Osmia species of bees including Osmia cornifrons also pollinate alfalfa flowers. Alfalfa honey is produced extensively throughout Canada and the United States, mainly Colorado, Idaho and Nevada. It is light in color, with a pleasingly mild flavor and aroma. Sweetness: not that sweet. It can be slightly less sweet than clover honey. · Honeys high in glucose sugar, with a low fructose to glucose ratio will crystallize more rapidly. · Honeys with a higher fructose to glucose ratio (containing less than 30% glucose) crystallize quite slowly and can stay liquid for several years, without special treatment, for example, robinia (black locust), sage, longan, tupelo and sidr (jujube). Antibacterial potency: low, mainly due to its peroxide feature. Much like acacia, orange, borage honeys. 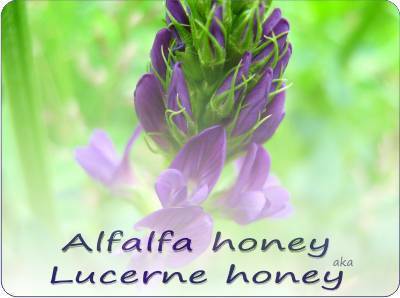 Many of the health benefits of alfalfa honey are common to all honeys. The most important thing here is to make sure it’s raw (unheated) and fresh (preferably in the first 6 months after harvesting). • Gives strength and energy to the body. • Has the effect of increasing breast milk. • Provides regular work of the stomach. • Lowers the level of cholesterol in the blood. In another study honey increases both in vivo (small and large intestines of rats) and in vitro the building of Lactobacillus acidophilus and Lactobacillus plantarum, while sucrose failed to produce any effect. It is not known if all types of honey have prebiotic effects and whether some honeys have a stronger prebiotic effect. From all the studied honeys, by now only sour-wood, alfalfa, sage and clover honeys have been shown to have prebiotic activity. The prebiotic activity of chestnut honey was found to be higher than that of acacia honey. Honeydew honey also have a high prebiotic activity, due to its high content of oligosaccharides. Theoretically at least, honeydew honeys contain more oligosaccharides and should have a stronger prebiotic activity than blossom honeys. This is a very useful feature in combating constipation. How to use alfalfa honey? This honey makes an excellent ingredient in homemade granola, vinaigrette, sauces and salad dressings due to its mild taste and grassy undertones. A fresh salad of baby greens with a vinaigrette sweeten with alfalfa honey will make your guests praise the cook! It also goes well with cheese, particularly Brie, and it is great drizzled over Greek yogurt or warm waffles or biscuits. Add it to spicy barbecue sauce for a sweet, complex glaze. Also, it is perfect for mildly sweet marinades for fish or chicken. Add some alfalfa honey in mustard and then dip fried tofu or chicken pieces in this mixture. Your children will love it! As it has no aftertaste and no strong aromas, it is perfect to sweeten your tea, cereals, toast… you name it! JOURNAL OF DAIRY TECHNOLOGY 64 (2): 247-253. What cures asthma? Here is a solution from apitherapy: aerosols from the hive! What is sage honey good for?